The Jeep JK 50" LED Light Bar Mount System from Motobilt was designed with function and form in mind. Often time people are puzzled on where to run the wires for the light bar and hide them from sight. When designing this bracket system this was addressed. We spaced the mounts out slightly to allow room for the wiring harness to pass behind the brackets. We do not provide wiring instructions for the LED light bar. The brackets are laser cut from 3/16" steel plate and formed on a hydraulic press brake. They not only provde a solid mounting point for your LED light bar they also provide protection for the a-pillars of the windshield frame. Our Jeep JK LED Light Bar Mount only comes in contact with the windshield mount. They do not come in contact with the windshield frame and a rubber gasket is not needed. The light bar mounts are shipped bare steel for you to paint or powercoat. We ship them this way because so many people want to color match their Jeep JK. NOTE: THIS LIGHT BAR MOUNT IS DESIGNED TO FIT LED LIGHT BARS WITH A MOUNTING WIDTH OF 50-1/4". THIS LIGHT BAR MOUNT WILL NOT WORK WITH RIGID INDUSTRIES 50" LED LIGHT BAR OR OTHERS WIDER THAN 50-1/4". Thanks for the orders guys. Let me know if I can answer any questions. Thanks for the orders. We are working on more JK related products. Be sure to stay tuned for updates. Installing a set of JK light bar brackets on a customer's Jeep at the shop. Bump.... we have many other light bar brackets to choose from. be sure to check out the website. We do our best to keep the Jeep 50" brackets in stock at all times. Let us know if you have any questions about the brackets. Thank you to all who have ordered. I wanted to say thank you to all of you that ordered over the weekend!! Would love to have some more customer installed pics! These brackets also offer great protection when off road! Go check out how you could win with your next order by clicking the link below. #motobilt4me / Motobilt Metal Fabrication Blog Motobilt, Inc.
Click on the link below to be entered to win a Motobilt front or rear bumper. Make sure to earn multiple entries. Which Motobilt bumper would you choose and why? Click here for info on our Labor day sale! 50" light bar! Click here! Oh, and did we mention SIX NEW PARTS? Click on the link below for details. 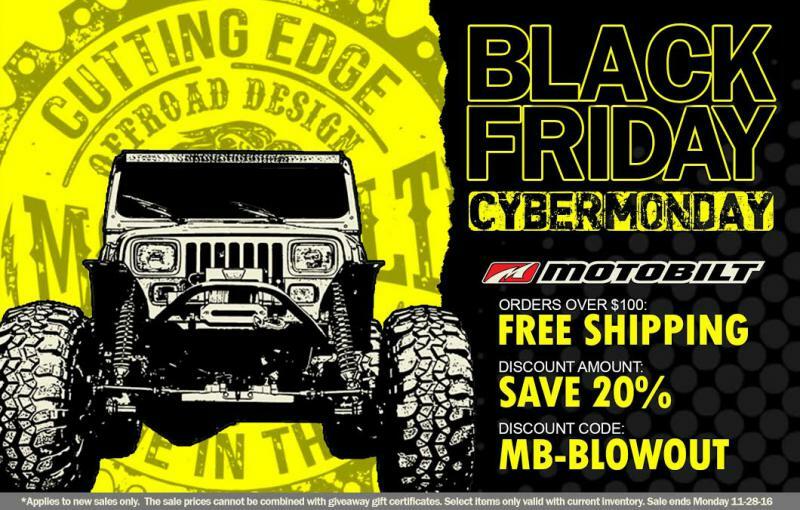 The Motobilt Black Friday Sale and Cyber Monday Blowout Sale starts NOW. All orders over $100 will receive FREE SHIPPING anywhere in the contiguous United States. In addition to FREE SHIPPING on orders over $100, use Code: MB-BLOWOUT for an EXTRA 20% off Motobilt products. PS: We have also lowered the prices on ALL Motobilt Jeep LED Light Bar Mounts. Stay tuned for an EXTREMELY LIMITED sale announcement.